Updated following games played on March 21. 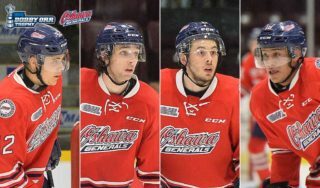 After 680 games the 2016-17 Ontario Hockey League regular season has come to an end. All 16 playoff positions have been claimed, four division titles have been won, and all eight first round matchups have been determined. 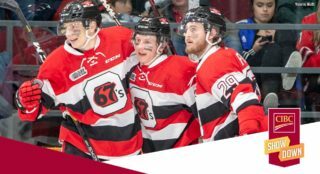 In the Eastern Conference, the first place Peterborough Petes will play the eighth place Niagara IceDogs, the second place Mississauga Steelheads will host the seventh place Ottawa 67’s, the third place Oshawa Generals will take on the sixth place Sudbury Wolves, and the fourth place Kingston Frontenacs will take on the fifth place Hamilton Bulldogs. In the Western Conference, the first place Erie Otters will face the eighth place Sarnia Sting, the second place Sault Ste. 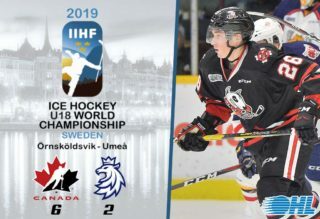 Marie Greyhounds who will host the seventh place Flint Firebirds, the third place Owen Sound Attack who will play the sixth place Kitchener Rangers, and the fourth place London Knights who will take on the fifth place Windsor Spitfires. Here’s a look at the final regular season standings and final first round playoff schedules. – Petes have clinched the East Division title and 1st overall in the Eastern Conference. They will play the IceDogs in 1st round playoffs (full schedule below). – Steelheads have clinched the Central Division title and 2nd overall in the Eastern Conference and will play the 67’s in 1st round playoffs (full schedule below). – Generals have clinched 3rd place in the Eastern Conference and will play the Wolves in 1st round playoffs (full schedule below). – Frontenacs have clinched 4th place in the Eastern Conference and will play the Bulldogs in 1st round playoffs (full schedule below). – Bulldogs have clinched 5th place in the Eastern Conference and will play the Frontenacs in 1st round playoffs (full schedule below). – Wolves have clinched 6th place in the Eastern Conference and will play the Generals in 1st round playoffs (full schedule below). – 67’s have clinched 7th place in the Eastern Conference and will play the Steelheads in 1st round playoffs (full schedule below). – IceDogs have clinched 8th place in the Eastern Conference and will play the Petes in 1st round playoffs (full schedule below). – Battalion have been eliminated from playoff contention and will select 3rd overall in the 2017 OHL Priority Selection on April 8. – Colts have been eliminated from playoff contention and will select 1st overall in the 2017 OHL Priority Selection on April 8. – Otters have clinched the Midwest Division title as well as the Hamilton Spectator Trophy for 1st overall in the OHL regular season standings. They will play the Sting in 1st round playoffs (full schedule below). – Greyhounds have clinched the West Division title and 2nd overall in the Western Conference, will play the Firebirds in 1st round playoffs (full schedule below). – Attack have clinched 3rd place in the Western Conference and will play the Rangers in 1st round playoffs (full schedule below). – Knights have clinched 4th place in the Western Conference and will play the Spitfires in 1st round playoffs (full schedule below). – Spitfires have clinched 5th place in the Western Conference and will play the Knights in 1st round playoffs (full schedule below). – Rangers have clinched 6th place in the Western Conference and will play the Attack in 1st round playoffs (full schedule below). – Firebirds have clinched 7th place in the Western Conference and will play the Greyhounds in 1st round playoffs (full schedule below). – Sting have clinched 8th place in the Western Conference and will play the Otters in 1st round playoffs (full schedule below). – Spirit have been eliminated from playoff contention, will pick 4th overall in the 2017 OHL Priority Selection on April 8. – Storm have been eliminated from playoff contention, will pick 2nd overall in the 2017 OHL Priority Selection on April 8. Game 1, Thurs, Mar 23 at Peterborough – 7:05 p.m.
Game 2, Sat, Mar 25 at Peterborough – 7:05 p.m.
Game 3, Tues, Mar 28 at Niagara – 7:00 p.m.
Game 4, Thurs, Mar 30 at Niagara – 7:00 p.m.
Game 1, Fri, Mar 24 at Mississauga – 7:00 p.m.
Game 2, Sun, Mar 26 at Mississauga – 2:00 p.m.
Game 3, Tues, Mar 28 at Ottawa – 7:00 p.m.
Game 4, Thurs, Mar 30 at Ottawa – 7:00 p.m.
Game 1, Fri, Mar 24 at Oshawa – 7:35 p.m.
Game 2, Sun, Mar 26 at Oshawa – 6:05 p.m.
Game 3, Tues, Mar 28 at Sudbury – 7:00 p.m.
Game 4, Thurs, Mar 30 at Sudbury – 7:00 p.m.
Game 1, Fri, Mar 24 at Kingston – 7:00 p.m.
Game 2, Sun, Mar 26 at Kingston – 2:00 p.m.
Game 3, Tues, Mar 28 at Hamilton – 7:00 p.m.
Game 4, Thurs, Mar 30 at Hamilton – 7:00 p.m.
Game 1, Fri, Mar 24 at London – 7:30 p.m.
Game 2, Sun, Mar 26 at London – 2:00 p.m. The top eight teams in each conference qualify for the OHL playoffs with the division leaders ranked one-two in each Conference. In the first round of the playoffs, first place plays eighth, second plays seventh, third plays sixth and fourth plays fifth in each conference. Teams are re-seeded within their conference after each round and the division winners are always ranked 1-2 within the conference as long as they progress. The champions from each conference play in the OHL Championship Series for the J. Ross Robertson Cup. The OHL Playoffs are scheduled to begin on the Thursday following the conclusion of the regular season. The first round series must be completed within 13 days; the second round series have 14 days to finish while the Conference Championships are 13 days in length. The OHL Championship Series is 14 days in length. If two or more teams are tied for the final OHL playoff position in either conference, sudden-death playoff games will be used to determine the team that advances, with the home team for such tie-breaker game being determined through the OHL standard tie-breaking system listed below. The team with the most number of wins during the regular season shall be declared higher in the standings. If two teams are still tied, the team with the best record in head-to-head competition (based on points including overtime losses) shall be declared higher in the standings. If more than two teams are tied after the first tie-breaker, the percentage of available points earned in games among each other shall be used to determine the standing. If still tied, the team with the greater differential between goals scored for and against by clubs having equal standing after the second tie-breaker shall be declared higher in the standings. 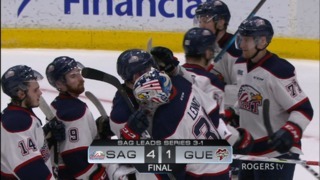 Between Two Teams: Two teams tied for the final playoff position will play a sudden-death game to be hosted by the centre determined higher in the standings by the OHL tie-breaking system. The winner will be declared higher in the standings. A sudden-death game will be played between the two teams having the lowest percentage as calculated by dividing the sum of goals ‘for’ plus the total goals ‘against’ into the total goals ‘for’. The home team will be determined by utilizing the OHL tie-breaking system. A second sudden-death game will be played between the winner of the preliminary sudden-death game and the remaining team. The home team will be determined by utilizing the OHL tie-breaking system. The winner will be declared higher in the standings. The Otters earned their third Hamilton Spectator Trophy and second straight regular season title with a league-best record of 50-15-2-1 becoming the first CHL team to earn four consecutive 50 win seasons. The Otters also claimed first overall in 2001. The Hamilton Spectator Trophy is awarded to the team that finishes the regular season first overall in the Ontario Hockey League. The trophy was presented to the Ontario Hockey Association by the Hamilton Spectator in the 1957-58 season. The winner of the Hamilton Spectator Trophy has gone on to win the OHL championship 23 times and the Memorial Cup 11 times. 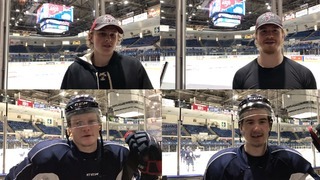 The Steelheads have earned their first Central Division title in the club’s five year history. This also marks the first division banner in Mississauga since the Majors finished atop the league standings in 2011. Past division titles in all-time franchise history were also achieved in 2004 and 2002 by the Toronto St. Michael’s Majors. 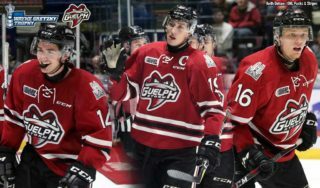 The Petes have earned their third East Division title following back-to-back wins in 2005-06 however this marks the 11th time in modern history they have finished atop their division. The Petes also won back-to-back Leyden Division titles in 1979-80, 1985-86, 1988-89, and 1992-93. The Emms and Leyden Trophies were first presented in the 1975-76 season when the OHL was split into divisions with the expansion of the league to 12 teams. The awards originated in recognition of Matt Leyden and Leighton ‘Hap’ Emms for their contributions to junior hockey in Ontario. The Greyhounds have earned their third West Division title in four years following back-to-back banner seasons in 2014 and 2015. The Hounds have won a total of six West Division crowns including wins in 2008, 2005, and 1997. The Bumbacco Trophy was inaugurated in 1994-95 when the league realigned into three divisions. The award is named after former Greyhounds’ General Manager Angelo Bumbacco. The Otters have earned their third consecutive Midwest Division title and sixth in franchise history following a previous stretch of three consecutive banner seasons from 2000-2002. The Holody Trophy, awarded in recognition of the contributions to the OHL by former Guelph and Owen Sound Platers Governor Joe Holody, was presented following the 1998-99 season for the first time with the realignment of the league into four divisions.